Billing itself as a “travel organizing app,” the trip notification site TripIt.com is even better than that — it can assist you by making upcoming travel plans more orderly and also provide rescue options when things don’t go as planned. TripIt.com works its magic in a quiet, high-tech way, by receiving emails and organizing travel details sent by airlines, hotels, rental car companies and other travel providers for you. Since its late 2007 launch, the site has assisted business travelers who forward emails with flight, hotel, and rental car confirmations directly to a TripIt.com account associated with their email address. TripIt.com ‘reads’ this data and creates an itinerary that can be shared with any other traveler welcomed by the account holder. Business colleagues who find themselves together on an upcoming trip, or sharing a layover in a little known airport, can easily be more social. Users who are not trying to find a dinner date or taxishare may prefer to shield their travel plans. 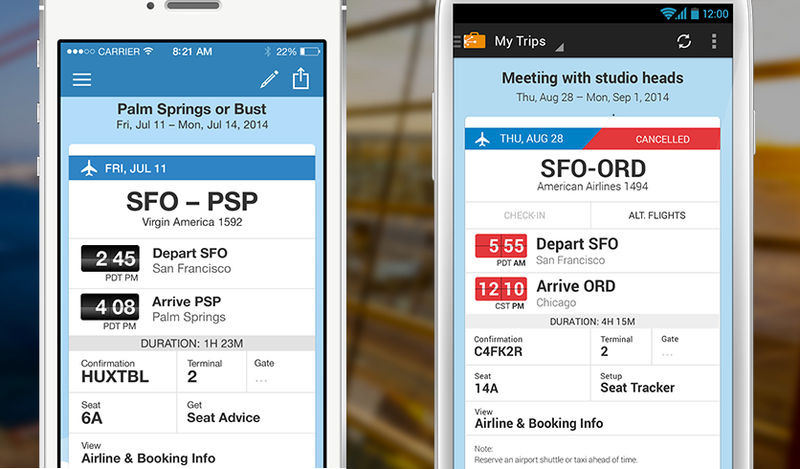 TripIt.com will send itineraries via a private link only to the number of family, friends or colleagues you authorize. Now owned by Concur, TripIt is also being used more and more by travel agents to supply “organized” itineraries to their clients. While it’s an effective tool for those who want to stay in touch with fellow travelers, as a busy mom, I found it invaluable in trying to schedule a spring break college tour with my teen. All the emails I forwarded to TripIt.com were neatly assembled in chronological order, with room to add my “Notes” — lunches with relatives, sleepovers at friends’ houses, appointments for college interviews — that would then appear in the final schedule. A new feature, the Traveler Profile, allows users to enter critical information such as passport numbers and expiry, children’s travel documents, important phone numbers, relatives’ contact information and more that can make retrieving lost credit cards, finding a doctor, or re-issuing a passport much easier if and when a travel crisis strikes. These aspects of the organizing tool are totally free to use. I recently completed a year-long trial of the premium TripIt Pro, sent to me by the company. It’s a steal at $49/year. The app absorbed data from standard emails well and efficiently, reminding me on my Android phone about upcoming flights and reservations. It also tracks frequent flyer miles and correspondence like flight refunds. On one layover, it buzzed me to say that a window seat was open on my next flight — a much better option than what I had — and I was able to grab it right from the app. The Pro version really does monitor flights in real time, sends you alerts as delays occur, and notifies you of alternatives — whether it’s better seats at checkin or other flight choices if yours is cancelled — very well. Where it broke down for me was when traveling in an “alternative” way. Flight bookings on Air India were sent in a plain text email that could not be parsed by TripIt so I had to enter all the data by hand. Rebookings done by an agent from my travel insurance company were also not recognized, causing more headaches. I do admire its capability — it functions for me much better than the Google app which is supposed to parse travel data from my gmail account — but it’s most valuable for someone who’s a frequent domestic U.S. traveler, flying with the major airlines, and booking through big OTAs and providers. We’re certainly not the first to discover this handy app and website, as it’s regularly honored by the technical trade and others. But we are pleased to see that TripIt.com is now more widely used by leisure travelers who value its organizational and de-stressing functionality and I, for one, will continue to use it. Can it grow with your needs? Note that it now has a paid feature that can organize travel for teams — be they corporate or soccer-ball-toting — that may serve you and your students well.